There are more than 400 songs on Super Smash Bros. For Wii U’s soundtrack. Some are original remixes. Some are holdovers from past Smash Bros. editions. Some are original tracks, ripped directly from NES classics and 3DS fashion simulators alike. All of them have been divided into themed groups and assigned in bulk to some nook among Smash Wii U’s boundless collection of mini-games and battle arenas. It’s possible that you’ll never even hear Little Mac’s theme from Captain Rainbow or the incredible medley of remixes based on The Mysterious Murasame Castle, both Japan-only Nintendo oddities. Venture into the My Music menu, however, and not only will you be able to discover those and hundreds of other gems, you can determine the rate at which each and every song shows up when you’re entering combat. Not a fan of the Mega Man remixes accompanying the Wily Castle stage? Not a problem. Just sub them out for some 8-bit originals. The choice is yours, and Smash Wii U is more than happy to oblige. My Music is exemplary of Smash Wii U’s prevailing ethos: Just give the people—all the people—what they want and let them hash it out. Aiming to create something that can be everything to everyone is a dicey proposition. More often than not, the end result is rudderless and scattered—nothing to anyone. But the developers at Bandai Namco and Sora Ltd. pulled it off with Smash Wii U, a remarkably vast and flexible outing that retains its identity despite casting the widest net possible. The brawling at the heart of the game is unchanged from Smash Wii U’s 3DS companion piece. It’s lively but never unwieldy, a healthy middle ground between the lackadaisical Super Smash Bros. Brawl and the GameCube’s Super Smash Bros. Melee, a hyperactive bucking bronco by comparison. But it’s no longer stifled by the 3DS’ limitations. The extra hardware horsepower and migration to a larger screen give the game enough room to breathe. I was immediately struck by how smoothly it all moved, the characters’ complicated but fluid animations adding even more vigor to its bustling gestalt. If, as I argued in my review, Smash 3DS felt like a step toward compromise between the two predominant modes of Smash (one being pure pandemonium fueled by a cavalcade of unpredictable items and hazardous arenas; the other, a stripped-down test of fighting skill without items), Smash Wii U goes even further, especially when it comes to the design of its stages. Smash 3DS was lousy with stages that featured overwhelming hazards or forced the combatants to keep up with its constant scrolling—both conditions that subtracted from the fight at hand. Those kinds of stages exist in Smash Wii U as well, but their number has been reduced. In their stead, the stage selection is populated with “traveling stages,” mobile arenas that swoop around and sink into the ground, allowing fighters to duke it out somewhere new before showing up again and whisking them away to another venue. They strike a nice balance between dynamism and fairness. Meanwhile, players who prefer Smash at its most spectacular need look no further than Orbital Gate Assault, a Star Fox-themed level where the melee jumps from spaceship to spaceship as the crafts explode or warp in and out of combat amid a huge space battle. Another advantage of moving away from the 3DS is that players finally have options when it comes to how they want to control the game—a lot of options. The Wii U’s touchscreen-clad gamepad is a perfectly functional default if you don’t have any other controllers handy, but Smash Wii U supports six other types of inputs. Nintendo is even selling a device that’ll let you plug in your old GameCube controllers (or one of its newly minted reprints). And as silly as it sounds, the fact that these controllers all work at the touch of a button and can be used together in any combination is impressive. Provided they have the necessary device on hand, anyone can jump into a game using their preferred controller. This unprecedented controller support really comes in handy during one of Smash Wii U’s big exclusive features: eight-player battles. Unsurprisingly, these expansive brawls are non-stop chaos when they break out on mid-size stages. In larger ones like Palutena’s Temple, a sprawling collection of narrow trap-laden hallways and platforms, fighters often pair up and battle on the stage’s outskirts, only coming into contact with the rest of the combatants when isolated clashes collide. In these cases, the madness might be better contained, but the stages are so large and the characters so spread out, you need a huge TV to stand any chance of making out what’s going on at any given time. Eight-player Smash might not be the best way to play if you’re looking for a pure test of skill, but when it comes to delivering anarchic spectacle, nothing can compare. While the 3DS version felt rightfully tuned for solo Smashers, Smash Wii U puts in extra effort to accommodate any number of players. There’s still plenty to do for those going at it alone. For one, the online multi-player is better than it ever has been. In my experience, one-on-one matches were close to universally flawless. Full four-player fights were more likely to experience some slowdown, but it was negligible compared to the stuttering of the 3DS version and the unplayable Super Smash Bros. Brawl. 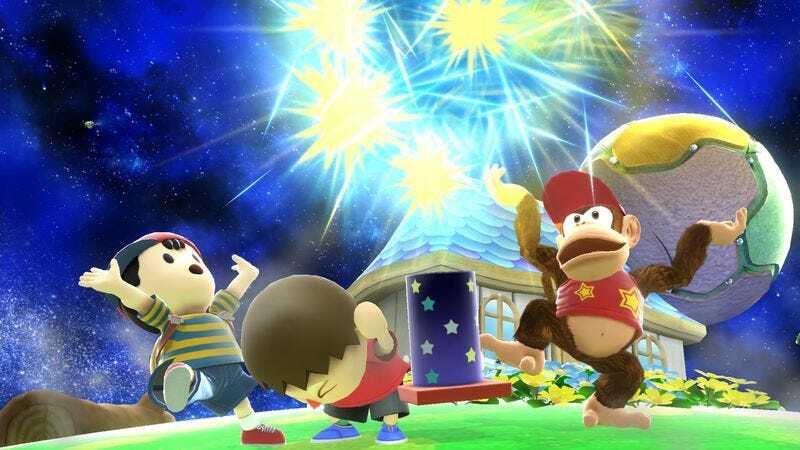 The real star when it comes to human-on-artificial-intelligence violence is the Event Match mode, which triumphantly returns after skipping Smash 3DS. These are special missions that task players with weird idiosyncratic challenges, like Fitness Junkie, where you play as the Wii Fit Trainer and beat up on a couple of giant Warios who won’t stop eating. Each Event you clear comes with a reward—like some gold you can use to buy your way into special modes or dish out for a number of doodads—but the greatest motivating factor of all is the chance to see what ridiculous, thinly constructed scenario is unlocked next. Unless you’re a fan of the stripped-down test of wills that is one-on-one Smash, it could be hard to find things for just two players to do in Smash Bros. past. Smash Wii U has a simple remedy: All the single-player modes can now be played with at least one other person. The specially designed cooperative Event Matches steal the show. A duo can brute force its way through most of them without much planning, but some demand levels of harmony usually reserved for world-class synchronized swimming teams, like the stiff challenge of defending Star Fox’s space cruiser from a horde of invading Mr. Game & Watch paratroopers. Some people will argue about how Smash Bros. “should be played” until the end of time. At one point, with the release of Super Smash Bros. Brawl, it seemed Nintendo had put its foot down and decided for all of us. But something changed the company’s mind in the time since. A cynic might see the mind-boggling scope and total flexibility as giving up, an admission that, just like the people who love it, Nintendo has no idea what Smash Bros. should be. But really, it’s a confirmation of what Smash Bros. has been all along: a raucous, reverent celebration of Nintendo games and the people who play them. And the best part is everyone’s invited.